no, i didn’t get a promotion at work (the boss doesn’t like me). but Julie still loves the ladder. i dragged it out to clean the arch window in the great room, and within 60 seconds of setting it up – here we go! just a quip to share with you. 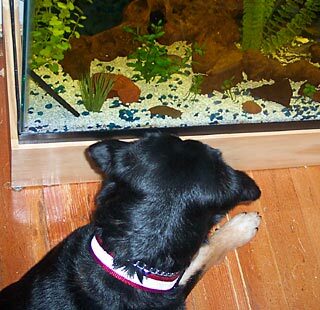 let’s all mark our calendars: the 17th day of January, in the year 2006 — the day which the dog became aware of the fish. 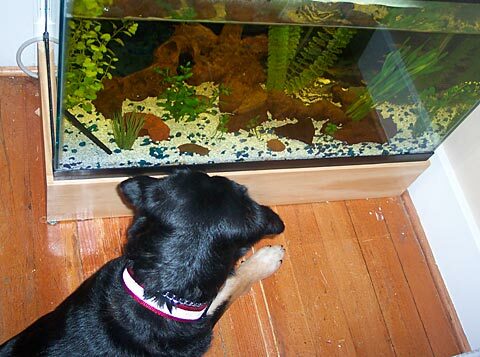 i don’t generally have a problem with this, but if she suddenly lunges at the tank, we’ll have about 29 gallons of water to deal with, all over the living room floor. so, you may have seen a picture of sally in my last post. but here she is, officially! and she loves the snow! watch her roll in it, then try and look dignified after.